Experience the glamour, excitement and style of a bygone era and feel like a movie star when you tour the beautiful Noosa River on the gorgeous classic speed boat Noosa Dream. 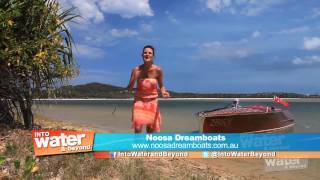 Noosa Dreamboats private cruises and tours are for groups of two to five passengers and your skipper Michael will give you a truly unforgettable experience as you explore this beautiful part of Queensland's Sunshine Coast. Enjoy a leisurely cruise around Noosa Sound, then experience the speed and excitement of classic power boating as you head up the Noosa River from Noosaville past Tewantin, towards Sir Richard Branson's Makepeace Island retreat, Lake Cooroibah and Lake Cootharaba. On your return journey, you can visit the river mouth and see Noosa's abundant bird life. You'll feel the wind in your hair and know that you are really living. Noosa Dreamboats also provide glamorous and romantic wedding transport and cruises and unique special packages. Their special packages include romantic catered sandbar picnic escapes and indulgent waterfront restaurant and cruise experiences. Escape with someone special for a one and a half hour Lake Escape Cruise followed by a fully catered private picnic on a sandbar or secluded beach. Noosa Dreamboats will provide a picnic platter filled with delicious gourmet food, a picnic blanket and cushions, ice bucket and glasses. Bring your own wine or champagne. * Gourmet Antipasto Platter (may include for example: marinated fetta, semi-dried tomatoes, olives, smoked salmon or salami/prosciutto, dolmades, sour dough bread and chocolate mousse cake and strawberries). * Cheeses, Fruit, Crackers and Tarts - a selection of gourmet cheeses to your taste, Crackers, Fresh fruit, Quince Paste and Lemon Tarts. * Classic Fish, Chips and Calamari - Noosa Dreamboats will pick up your order during your cruise so that the fish and chips are hot and delicious and ready to eat. * Deluxe Seafood Platter - A cold, fresh platter of seafood including spanner crab, prawns, bugs, salad, bread rolls and salad. Other meal options are also available on request and this package can also be upgraded to include The Grand Tour Cruise. Set your spirits free and get away from it all as you escape town and travel up the Noosa River to beautiful Lake Cooroibah in the hinterland. See the multi million dollar homes of Noosa Sound. Cruise past the beaches of Noosaville and the houseboats of Tewantin. Views of the Noosa north shore and Sir Richard Branson's private island resort. Cross lovely Lake Cooroibah and see stunning hinterland vistas. Drift silently amongst pristine bushland and enjoy the peace and solitude. Visit the river mouth and see Noosa's abundant bird life. Complimentary digital photos. On our ultimate tour you'll explore Noosa Sound and travel all the way up the Noosa River past Lake Cooroibah to the entrance of the second big lake - spectacular Lake Cootharaba. This tour includes complimentary sparkling Australian wine and snacks. Explore Noosa Sound and see the beaches of Noosaville and the houseboats of Tewantin. Views of the Noosa north shore and Sir Richard Branson's private resort island. Cross beautiful Lake Cooroibah and see stunning hinterland vistas. Drift silently amongst pristine bushland and enjoy the peace and solitude. Explore the remote Noosa River beyond John's Landing and historic Tronson's canal. Enjoy beautiful views across Lake Cootharaba to the Great Sandy National Park. Visit the river mouth and see Noosa's abundant bird life. Complimentary digital photos. Savour a taste of the classic boating lifestyle and discover Noosa's waterways as you explore the lower Noosa river. See the multi million dollar homes of Noosa Sound. Cruise past the beaches of Noosaville and the houseboats of Tewantin. Views of the Noosa north shore and Sir Richard Branson's private island resort. Visit the river mouth and see Noosa's abundant birdlife. Complimentary digital photos.